Inverting rules with obvious relish, Florentine artist Piero di Cosimo (1462-1522) is known today, as he was in his own time, for his highly personal visual language, one capable of generating images of the most mesmerizing oddity. Endlessly inventive, versatile, and often playful, Piero defies easy classifications or labels. 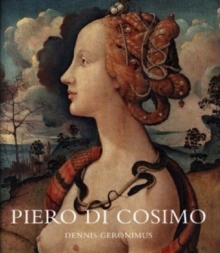 In this book, Dennis Geronimus overcomes the scarcity of information about the artist's life and works (only one of the nearly sixty known works by Piero is actually signed and dated) and pieces together from extensive archival research the most complete and accurate account of Piero's life and career ever written. Unfettered imagination was the sign under which Piero exercised his pictorial invention throughout his life, and yet the complicated artist was also a product of his culture. The book fills gaps in the artist's biography and along the way, sheds light on the social, literary, and artistic traditions that stimulated a demand for his novel work. The author provides intensive analysis of Piero's protean imagery, discusses his various patrons and commissions, and lists his extant, lost, and uncertainly-attributed works.